* Director of Personal Training for Coop's Health & Fitness in Greenville, Anderson and Spartanburg, South Carolina. Ultra Fit nutrition and exercise program. In addition to international recognition as a weight loss and fitness expert, DeFendis has been a spiritual and motivational speaker, professional athlete, performance/lifestyle coach for over 34 years, and has guided thousands of Americans in the definition and achievement of their professional and personal objectives. His philosophy of Relentless Pursuit can best be illustrated by his defined objective of a Mr. USA title, committed to paper at age thirteen, and ultimately achieved in 1988 at age thirty. More than a generation of short-term emotion, DeFendis initiates sustained, quantifiable achievement with the individuals and organizations with which he works. DeFendis developed Ultra Fit 28 years ago and executes the program through a national team of personal trainers. Ultra Fit is the most comprehensive weight loss, toning and shaping, and anti-aging program available and since its development, has produced tens of thousands of success stories. The program is responsible for results which include the loss of 100 pounds or more by hundreds of Americans in the last 2 years alone, and has been featured on a number of major television programs and networks including Hard Copy (4 times), ABC TV's 20/20 with Barbara Walters, Fox News, CNN, CBS, & ABC News, ESPN, The Joan Rivers Show, and NBC Sports. The potential elimination of prescription medications for cholesterol, high blood pressure, and type 2 diabetes and their cost. Reduction in lost-time injuries and absenteeism. Improvement in professional and personal relationships due to increased self-esteem and self confidence. Speaker of the House Newt Gingrich and 17 Senators & Congressmen at the Congressional gym. CEO of American Express Jim Robinson. Professional ballplayers Mike Piazza and Luis Alicea. Numerous seminars for the Atlanta Braves, St. Louis Cardinals, and the Phoenix Suns Basketball team. Personal training of over 300 champion titleholders in Figure, Fitness & Bodybuilding. International Fitness Hall of Fame inductee along with fitness superstars Arnold Schwarzenegger and Jack Lalanne. Trainer of the Year" for 9 consecutive years for the state of Florida. In addition to the above, DeFendis has hosted radio talk shows and television shows on fitness and nutrition, as well as in general interest. Additionally, he has written a syndicated newspaper column which was published in 28 newspapers and currently writes a newspaper column entitled "Your Personal Trainer." 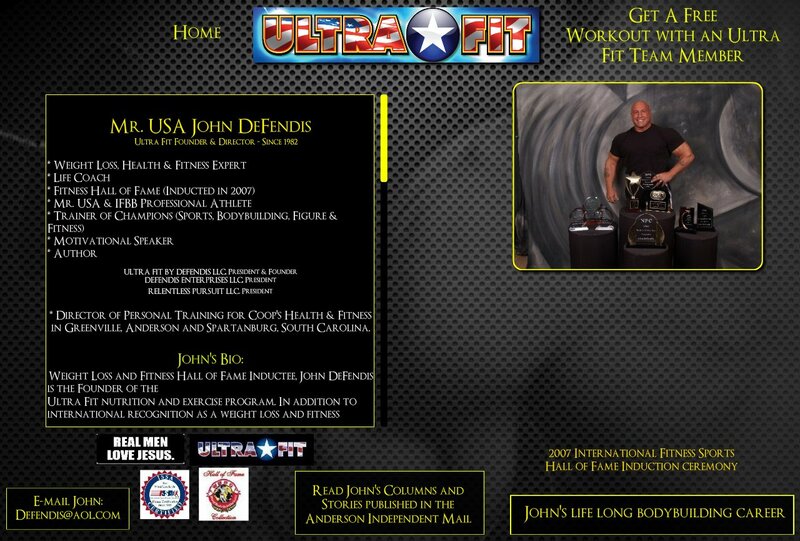 John DeFendis maintains his health and strength at over 50 years old and is a representative and example of fitness over 50 and how the lifestyle can benefit us as we mature towards our senior years.